A tasting that brought home to me a certain nostalgia. A poster on the wine forum wineberserkers.com recently lamented the loss of Old School Bordeaux. He went so far as to give “faint praise” to the 1982 vintage, while extolling the virtues of the 70s and 60s. I found his comments a bit strange but ended up understanding somewhat his point. Wine was not made as well back in those years. But the wines that are good from that era have sometimes turned out superb today. Many have greater freshness. It is like looking back at movies from that era compared to the super glitzy, digital, very well made films today, that tend to have more action and less interesting dialogue. In the world of wine in many places today, replace the words “action” and “dialogue” with “alcohol” and “complexity”. There are exceptions. The Artist, anyone? A superb, silent and glorious film… But I digress. As I listen to some average 70s music by Peter Frampton, I am reminded that not everything that is old school is necessarily good. Not to pick on poor Peter. He did pen some nice tunes, and I do enjoy his rendition of Stevie Wonder’s Signed Sealed Delivered and that wonderful live wa-wa jam Do You Feel Like We Do. But he would not be my main reference for older rock music. I would look to The Who, Led Zeppelin, The Rolling Stones, The Beatles of course, as well as tons of others, from David Bowie and The Velvet Underground and Jethro Tull to The Kinks, Pink Floyd and The Yardbirds. Same for wine. I suppose. Yes this is a facile comparison but it can hold merit. The thing is, the treasures you find from the older era make you wonder how some of the new, high alcohol wines will age. Can anyone know for certain? I find reviewers going out on a limb when they say that such and such a wine will age 50 years. OK, one can obtain certain clues. It is likely that a high octane wine, with tons of alcohol, tannin, fruit and acidity – all “balancing” out – will age. But will it age well? Will it age to my taste? Ah, now, that is the interesting question. As I am discovering more and more, palates like mine – palates that like vivacity in their wine – it is hard to beat the wines from Burgundy. Yes, the Pinot Noir based wines from that famous winemaking region in France that can age very well indeed. 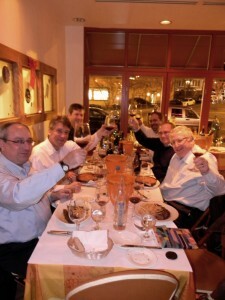 As I found out with a group of friends and expert tasters in the Washington D.C. area. Thanks to Ken Brown who organised the event as a “holiday dinner”, which was held in the wake of the holidays, on 5 January 2012. At our favorite BYOW joint, Lavandou on Connecticut Avenue. Being a holiday dinner, participants brought some excellent wines. Special occasion wines. Sadly several participants – including Kevin Shin, Chris Bublitz and David Zimmerman – could not make it, because of illness or work issues. But we had a great time nonetheless. Ken Brown brought perhaps the wine of the night, although that is hard to say… as you will see later. Let’s just say that the Francois Gros Richebourg Grand Cru 1971 (Francois was Anne’s father) provided me with (yet another) Burgundian wine epiphany. As most readers know – and as you can see on this website – I am a huge Bordeaux fan. And I remain so. But the Richebourg dispelled any general notions that Pinot Noir is meant to drink earlier than Cabernet Sauvignon and Merlot from Bordeaux. 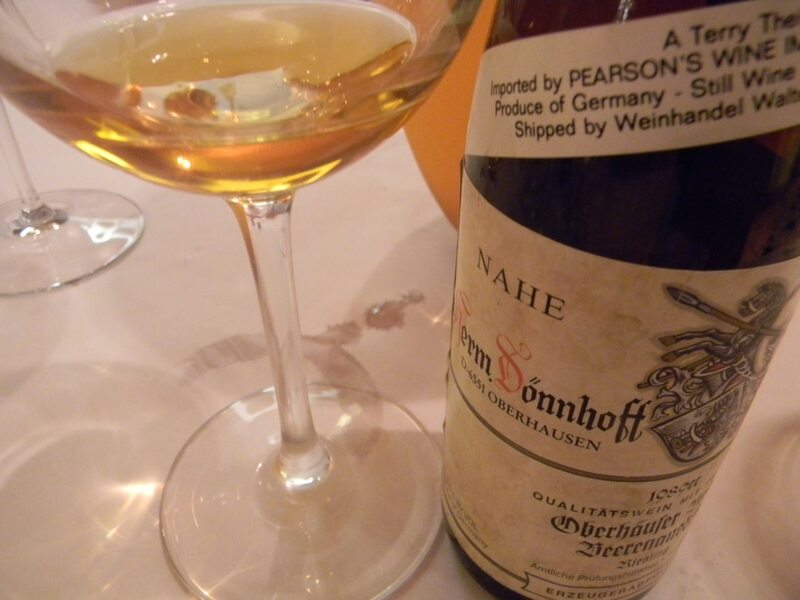 At just over 40 years of age, the wine – see photo far above – exuded a kaleidoscope of flavors and aromas, ranging from spice and subtle faded … and beguiling fruit. 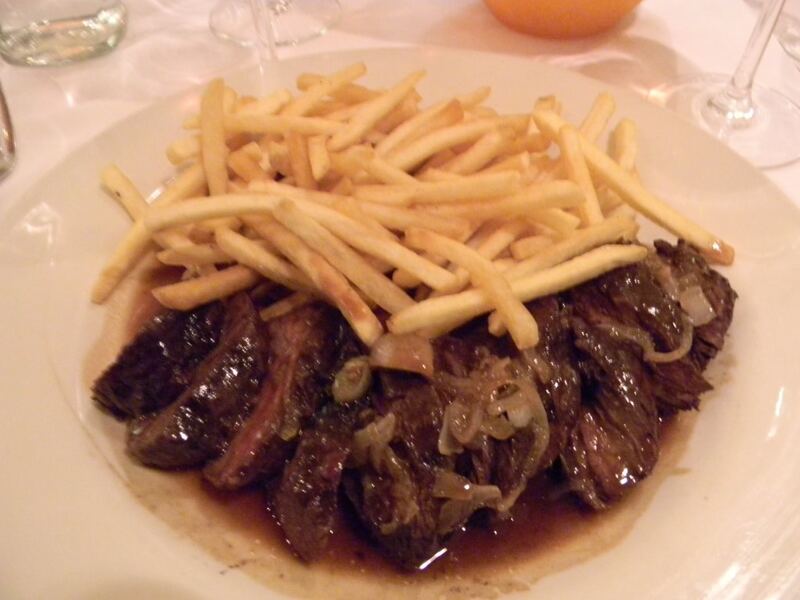 When drinking great red wines, nothing beats simplicity, such as this Steak Frites at Lavandou! What impressed me most was its depth and length and texture. The wine was vibrant and alive, with a very pleasing finish. Yes, there was a bit of rusticity on the initial palate, a hint of beef blood/iron. But that was to be expected, given its age. What impressed most was its overall sumptuous nature. Richebourg counts as one of the greatest grand cru vineyards in Burgundy. I understand why. No points here, just an overall excited reaction. Bravo to Ken for bringing this wine. 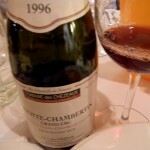 Domaine des Chezeaux Griotte Chambertin Granc Cru 1996. Chris Sipes brought this wine, which was paired with Randy McFarlane’s G Figlio Monprivato Mascarello Barolo 1996. Two very different wines, both superb. But if I had to choose, if I was given a dire choice between the two, I would have chosen the Burgundy. The Barolo was very rich, exuding ripe cherry like flavors, and tasting far more youthful than its years. There was a pigment like concentration about this wine, which also had much grip and freshness. So, it was almost perfect in one sense. The Richebourg described above was also paired with another Burgundy, which may be a candidate for number two wine of the evening. 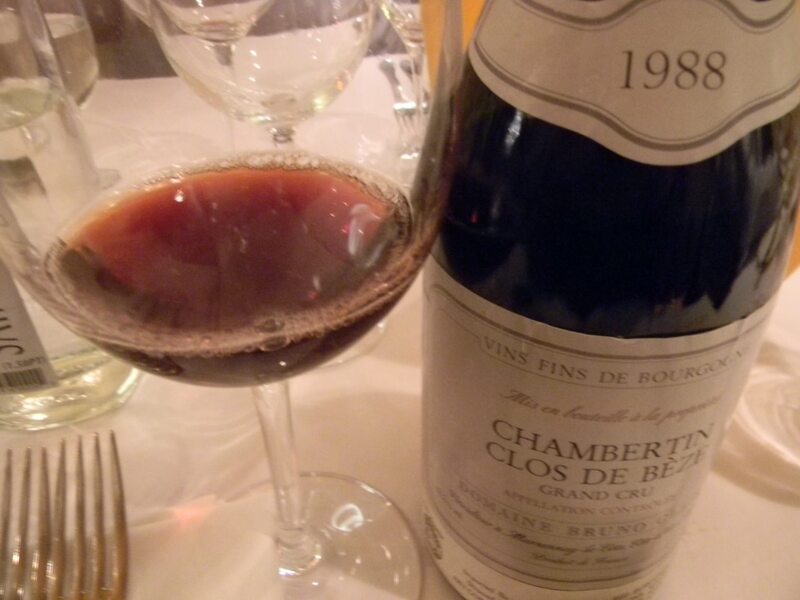 Thanks to Ken Barr for bringing a profoundly lovely Bruno Claire Chambertin Clos de Beze 1988. Another vintage with highish acidity, no? At 13.3% alcohol, there is also fine glycerine and ripeness. And some unresolved tannin on the finish, more than suggesting that this wine will only improve in a few years. And yet, time in glass resulted in the wine opening up more and more. Expanding on the palate, with a mix of toffee and mineral without ever being heavy. There is a real elegance to this substantial wine that also dances on the palate. Ken and I insisted on serving the Bordeaux and California Napa Valley Cabernet after the Burgundians… This proved to cast the Bordeaux somewhat poorly. 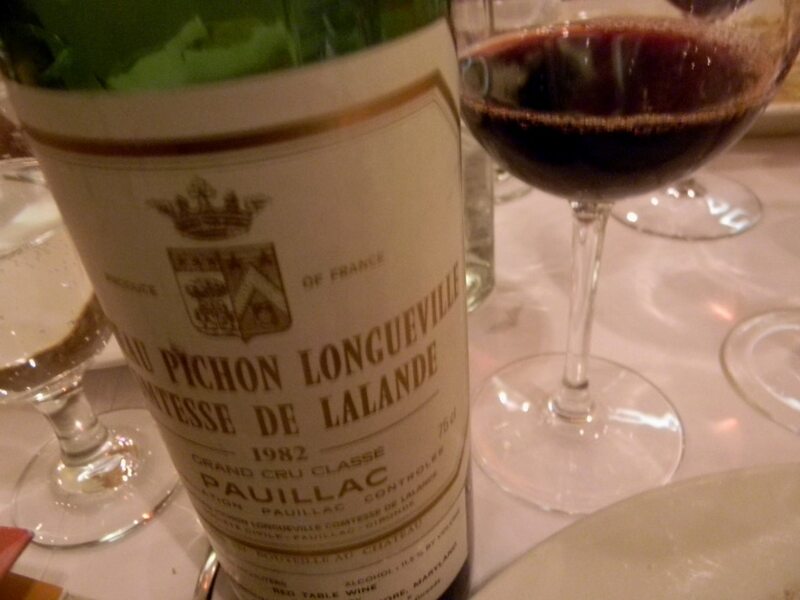 And we are talking about a 100-point Robert Parker wine, the Chateau Pichon Longueville Comtesse de Lalande 1982, which Paul Marquardt had brought. At first I thought it was not quite as fresh as the two bottles I had tried in New York City two years ago, brought from the chateau by then winemaking director Thomas Do Chi Nam (who has since joined the team at Chateau Margaux). 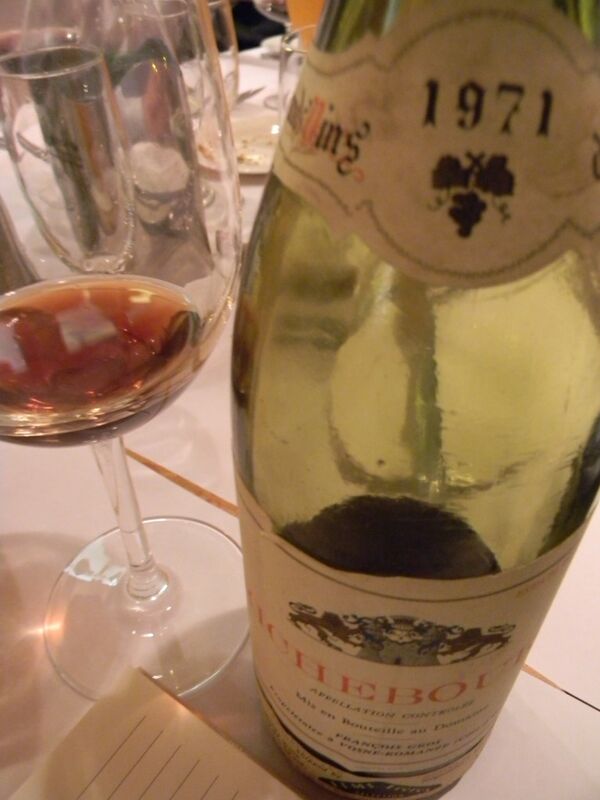 But I am now rather convinced that it showed badly only mainly because it followed the one-two punch of the 1971 and 1988 Burgundies that had more freshness overall. 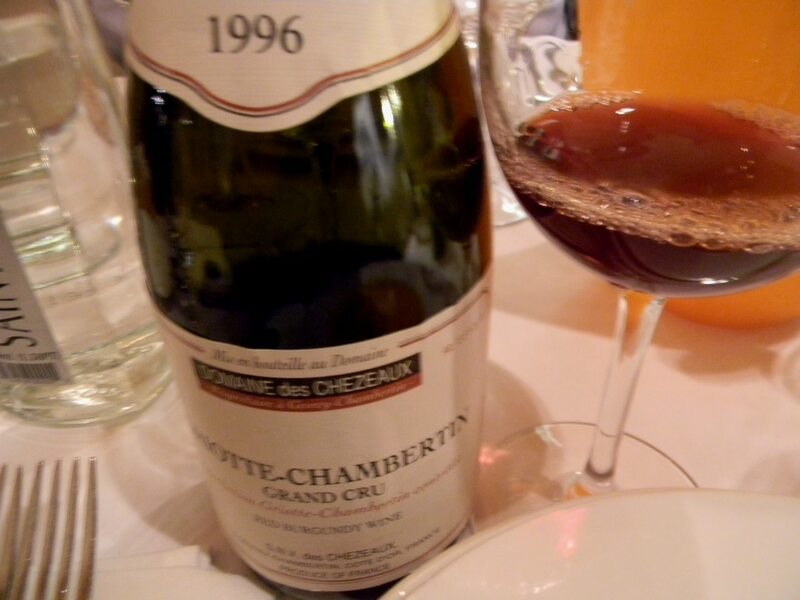 Still, the Comtesse displayed amazing concentration and youth for a wine that is almost 30 years old. I loved its olive and cassis and graphite flavors. A superb Bordeaux. 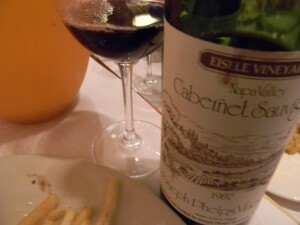 The Comtesse was paired with Howard Cooper’s lovely Joseph Phelps Eisele Vineyard 1987, which exuded eucalyptus and mint aromas, showing a more open profile than that of the Comtesse, certainly more openly fragrant and on the palate more expressive. I would say that it was drinking better than the Bordeaux, but the Comtesse seemed to have more concentration. 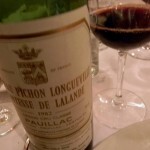 My tasting acumen was not in top form that night, as I took a whiff of the Vega Sicilia Unico Ribera Del Duero 1986 that Paul had also brought and proclaimed “great!”… The palate was fine, too, methought. Well, it did have a peppery aspect, and lots of concentration and unresolved tannin. The palate impressed me, but there was a hint of TCA that my TCA detector such as it was that night did not catch. Ken caught it, and it only revealed itself more as the wine stayed in glass. But I have to say that it was not too obvious at first. Oh well! I am sure that this wine would have been superb, if it had been unhindered by the faulty cork. This was perhaps the best series of stickies I have had in a while. 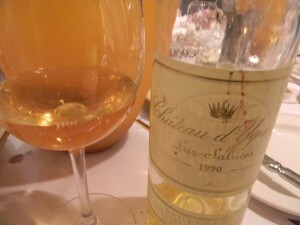 And I must pat meself on the back for bringing another contender to wine of the night: Chateau d’Yquem 1990. 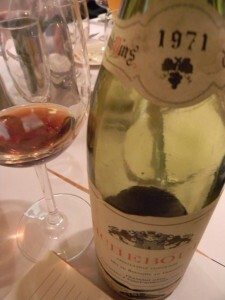 It was my only bottle, purchased in the French Auchan hypermarket back in 1998 for about $200. A tobacco and white pepper coolness intrigued me most, matched to ripe orange cake and blood red orange flavors. 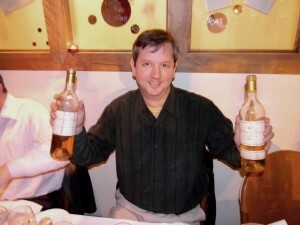 The texture was Sauternes but never thick or cloying. This is the top wine of the appellation, and readers should be reminded that it had been given the unique category of Premier Cru Supérieur back in the 1855 Classification of the Medoc and Sauternes. Yes, there were four premiers crus from the Medoc and even more premiers crus from Sauternes, but Yquem was alone, rated as a “superior premier”. 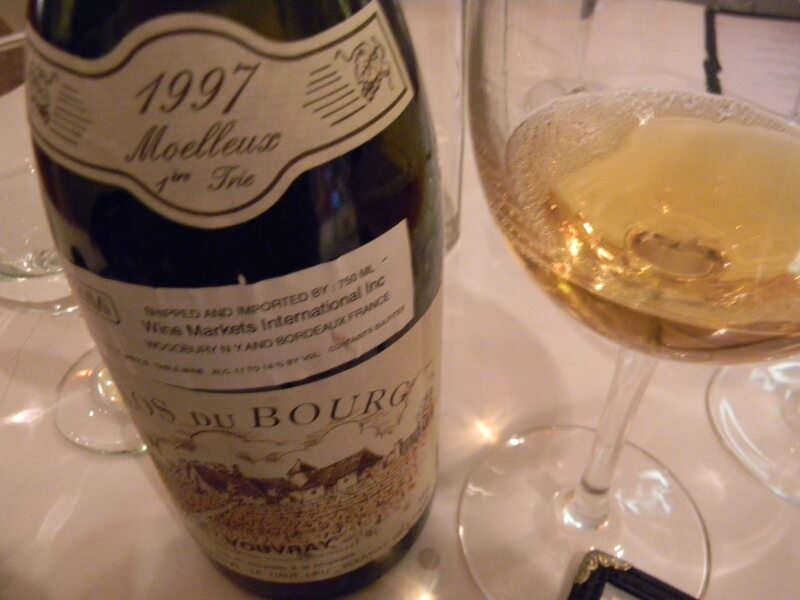 Tasting this 1990 reminded us all why. It was paired with what would have been a downright honorable Chateau Climens 1986 that Ken brought. But the Climens – with fine light orange and lemon flavors, and bright acidity and energy – could not compare, try as it might. It seemed to be a touch abrupt on the finish and two-dimensional to the Yquem’s multi-dimensions. Well, now, in all fairness to Climens, I have to digress and relate an opposite comparison at Chateau d’Yquem a few years ago over dinner, where a Chateau Climens 1976 outgunned a Chateau d’Yquem 1983… Still, on 5 January 2012, Yquem 1990 ruled. I always learn things when I taste with the esteemed palates of the Washington Winos! Sitting next to me, Ken Barr explained why 1990 was such a great vintage for German late harvest wines, because of their acidity and ripeness. 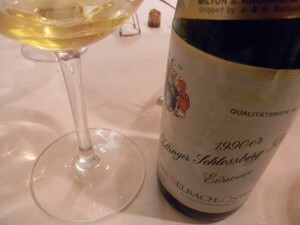 A vintage like 1994, he further explained by contrast, had “ridiculously high” acidity but lacked ripeness. 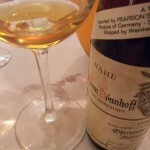 Here by the way, a decent link to recent German vintages. 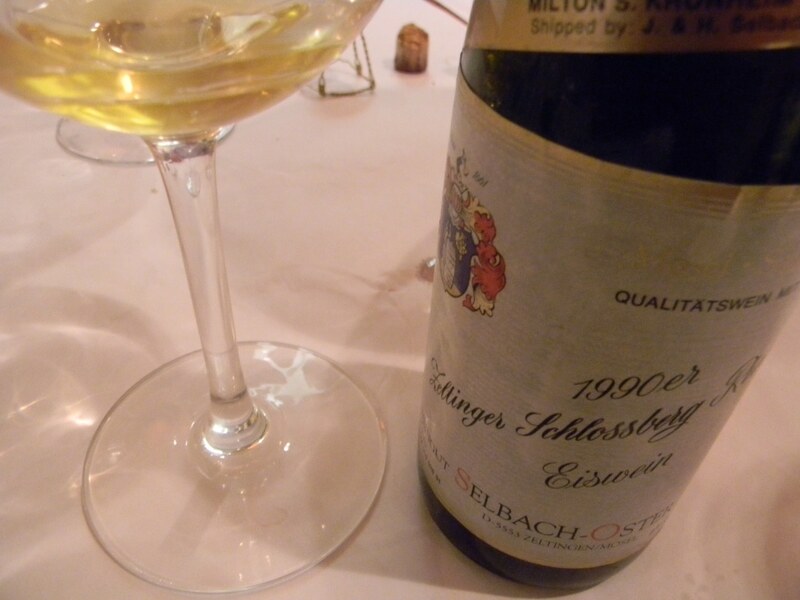 Ken brought the Weingut Selbach Oster Zeltinger Schlossberg Riesling Eiswein 1990 which was nothing short of superb, conveying mineral and cool tobacco with vibrant grapefruit in a very bright and youthful expression. A wine that pleased, again, my penchant for vivacity. Another contender for top wine honors of the evening? Perhaps third place? Each year I get a mailer from Domaine Huet with a listing of prices, including older vintages. This evening reminded me why I must buy more Huet. Thanks to Chris Sipes we enjoyed also the Domaine Huet Clos de Bourg Le Haut Lieu Moelleux 1er Trie 1997, a delectable Chenin Blanc with ripe peach and cinnamon flavors and a palate displaying excellent grip and energy. The color was dark and I was initially worried that this would be oxidized, but that was not the case. A very enjoyable late harvest wine from Huet! Great work you’ve done. Good content and i enjoy spending 15 minutes a day reading all the new posts. Good job, thanx ! !